Turkey’s Tırsan Group has never made a secret of the fact that it was aiming to become a global trailer manufacturing authority that would drive innovation across nations, cultures and different schools of engineering. Established in 1977, it took less than a decade for the family business to become the country’s predominant transport equipment brand, and less than 15 years to outgrow the role of local hero and morph into one of the first multi-national conglomerates in the history of trailer building. During the early 1990s, the company was not only one of the first to be granted membership to the German-Turkish Chamber of Commerce and Industry – a move that would establish it right at the heart of a reunited Europe – but it was also selected to produce French Lamberet reefers under licence, enabling it to play an integral role in introducing international transport businesses to European semi-trailer design. By 1998, Tırsan had set up the industry’s first Turkish-owned manufacturing plant outside Turkey in the northern German village of Goch; and by 2002, it had successfully revived Kässbohrer, one of Europe’s most prestigious and longest-running transport equipment brands. The landmark acquisition firmly placed Tırsan on the global manufacturing map and paved the way for a unique multi-brand set up as practiced in the automotive space, with a discreet parent entity managing a range of highly innovative, often product-specialised brands that operate independently, but benefit from synergies on a production, procurement and R&D level. In 2003, Tırsan reinforced that notion with the acquisition of Talson, a 35-year-old box trailer specialist based out of Venlo, The Netherlands – enabling a distinct ‘three-brand, one vision’ structure that is still valid today. But, that doesn’t mean the company’s remarkable rise from local champion to global juggernaut was complete. Less than a decade on, having weathered both GFC* and the devastating Eurozone crisis, the journey continued with Kässbohrer becoming the first European OEM to boast a fully-owned production facility in Russia, followed by the celebrated return of Kässbohrer to the brand’s historical home in Ulm in July 2017. Entering the 2018 IAA Show as the fifth-highest ranked European company in Global Trailer’s OEM Ranking, the Group around Chairman Çetin Nuhoğlu would thus have every reason to catch a breath and celebrate Kässbohrer’s 125th anniversary – but according to the company patriarch, there is much more to be achieved. Ever so inspired, he says he will continue to work on his grand vision to build a company that is constantly growing and evolving – much like the industry itself. In a world-unique triple interview alongside his daughters and fellow board members, Ayşenur and Zeynep, he also gives a unique insight into the culture and mindset that enable the ongoing evolution of what it still very much a family enterprise – and reveals his dream of bringing the highest level of innovation to every segment of the industry. Q: Since founding Tırsan in 1977, you have created a pan-European conglomerate consisting of what is still Turkey’s most powerful local brand, German icon Kässbohrer as well as Dutch box trailer specialist, Talson. How do you manage such an organisation? Çetin Nuhoğlu (ÇN): The key is to create a consistent culture across the Group. All brands under the Tırsan Solutions umbrella honour a culture of continuous development and innovation for the purpose of delivering innovative, cutting-edge technology – not only to our customers, but also to the industry as a whole. All necessary means to accomplish this purpose – from engineering competence to lean production techniques and our commitment to quality and sustainability – figure among what we call the ‘hard line’ values that apply to every brand we own. Zeynep Nuhoğlu (ZN): That’s also why each acquisition we have ever made focused specifically on bringing a uniquely innovative brand into the fold. For our President of the Board, the ability to innovate and push the envelope is the single-most important performance attribute of a company. At the same time we respect each brands’ identity, individual origin, product range, as well as heritage. For example, Kässbohrer’s success is built on the brand’s German engineering legacy. So we treat it as an engineer’s solution, and we expect an engineers’ precision from our sales force. In a time in which most of our industry churns out identical products and services, we can craft trailers that make a real difference for our customers from Ulm to Seoul. Q: How are the other brands? A: Tirsan’s focus is on relationship building. Every Tırsan Trailer is a product of a partnership we build to last. You may rely on Tırsan to make happen what matters to you most, mile after mile. Talson, meanwhile, is an expert in transferring state-of-the art aircraft technology into box trailer design, delivering innovative, sustainable equipment that is reliable and functional. Q: With the parent Group being the connective tissue between them. ÇN: Exactly. The parent holding is setting the standard for manufacturing excellence and production quality. Over the past five years alone, we invested €54.5 million into infrastructure and human capital to ensure all brands are aligned and conform with the same quality standards. The result is a Tırsan Solutions-specific production and management system we call Tırsan Solutions System, or TSS, and it’s key to our ongoing success. Q: What does TSS entail? ÇN: TSS stands for all the methods and processes we employ to provide the highest product quality and the best Total Cost of Ownership (TCO, ed.) for our customers – including on-site quality assurance practices, 8D reports and lean techniques such as value stream mapping, Kaizen, Jishuken or Kanban. Our goal is to eliminate waste, which is the greatest sin in lean manufacturing. At the same time, we also invest in the technical and lean competences of our teams to cement a culture of lean and continuous development. Investing in both people and system, TSS enables the sustainability of our business model across all three brands. Q: Does that mean certain design and engineering activities transpire beyond brand level? Ayşenur Nuhoğlu (AN): Yes, we align our R&D practices according to product segments, meaning each product family has its own, dedicated R&D team. They report to an engineering board consisting of our chief engineers and the heads of each R&D team. It’s the board’s job to assess new technologies and find solutions for the specific challenges and regulations different product segments have to navigate in different markets. The board identifies the opportunity, if you will, and helps the respective R&D team embed it into the product. Downstream, we then focus on adapting each solution to suit the brand and the specific brand clientele. It’s much like countries – they all have different different personalities, a unique tone of voice and aesthetics, but formal complexities are often managed in unison. Q: And on a strategic level? How does TSS affect the way you plan for the future? AN: We position ourselves not only as a manufacturing, but also as a technology company. Hence why we have a project management office solely dedicated to integrated information asset and knowledge management. This unit is mainly responsible for providing the necessary physical and virtual infrastructure to enable centralized knowledge management in the most efficient way possible. Q: How do we have to picture that in real life? AN: To safely accommodate our geographical expansion and growth, the project management office closely follows latest technological developments and trends – think digitalisation, machine learning and artificial intelligence – and incorporates these technologies into our management systems and production processes. Working closely with universities and start-ups, it’s also tasked with improving our in-house software development skills. In short: Our centralised information management systems ensure the smooth functioning of our processes, and support our global operations in a reliable and responsive way. Q: What does all that mean for the individual employee? Do they identify with a specific brand or the Group at large? ÇN: Everyone here is fully dedicated to Tırsan Solutions System’s engineering goals as well as to the individual brand and culture to ensure none of them loses their unique identity attributes. As an example, we have established a centralized lean suggestion system via TSS that enables continuous bottom-up improvement. Through this system, more than 1,000 suggestions are evaluated and implemented every year across our brand portfolio. Our suggestion champions are always appreciated and rewarded. ZN: Our group is a young one. They are well educated, highly skilled and selected with the utmost care. This team is coached and mentored by over 100 senior employees – many of them have been with us since the foundation of Tırsan – within a corporate culture that encourages and acknowledges personal and professional growth. Q: Speaking of growth, where do you see the Group headed in the TSS era? Where do you see yourself in 2020? ÇN: Our goal is to produce 20,000 trailers by that time. We want to be the third-largest OEM in Europe and climb to eighth in the world. Q: How will you make it happen? ÇN: To achieve our vision for 2020, we foresee an additional €30 million investment to our production technologies and systems to broaden our physical capacity and human resources. Our number one priority, however, will always be to establish long-term, sustainable partnerships with our global clientele. That’s why our Customer Relations Management reports directly to the Board. Beyond the immediate needs of our customers, business development and strategic planning are especially important to us: We constantly work on new models to be on par with upcoming trends. As part of that, we closely follow the developments in other industries that might propel and strengthen our own. We have a strategic business development unit dedicated to this task alone. They work with universities, international NGOs and policymakers to catch on and comprehend new trends and transformations. They channel the developments towards our present working models for the sake of the industry and, once again, to benefit our customers. Q: How much growth potential do you see in the market, though? Europe is currently experiencing a boom, but experts have already warned of a sudden cool down. ÇN: We do expect a wave of consolidations and mergers among European logistics companies in the near future, but we believe they might actually stabilise the market as a whole and thus result in increased growth down the track. We also don’t look at Europe exclusively. Globally, ongoing population growth, urbanisation and fundamental life-style changes will inevitably lead to more growth. What’s more, digitalisation will mobilise the idle capacity of logistics operations and lead to more productivity – once again opening up new opportunities or us. ZN: We don’t think a substantial cool down is likely. Western Europe and Russia will remain the regions with highest growth potential between 2018 and 2020. Germany, Europe’s biggest trailer market, still grows by over 10 per cent, and Russia has been on the road to recovery since early 2017 and is expected to generate a growth of over 30 per cent. Q: Moving from macro- to micro-level: The European market is more crowded than ever before right now, with Schwarzmüller, Lecitrailer, Kögel and Wielton all adding capacity and gearing up for growth. What’s your take on the situation? ÇN: We’re obviously not the only company that has realised these growth opportunities, so we are on high alert and constantly adjusting our strategy and investments accordingly. That’s especially true for CIMC’s alleged return to Europe – it forces us to constantly question and improve our business models. Q: Which role does Kässbohrer play in averting that threat? AN: Kässbohrer is an important asset for us, especially now that we are able to celebrate the brand’s 125th anniversary. There is a lot of heritage attached to it that continues to inspire us every day and that will allow us to stay ahead of the pack. AN: Kässbohrer has been a pioneer in vehicle engineering since the day it was founded, so Kässbohrer’s customers have grown accustomed to, and thus expect, the most innovative solutions on the market. That’s a tremendous motivation for all us. With our products and services, we keep the tradition alive and provide transport solutions that address the unique and complex challenges our global customers face every day – all under premise of reducing TCO (Total Cost of Ownership, ed. ), efficiency and sustainability. Especially in light of growing competition, we combine conventional R&D projects – focusing on weight reduction, aerodynamics, insulation performance and operational efficiency – with new technological developments such digitalisation, which allows us to make the trailer part of a greater eco-system. We also work on the automation of trailer loading and unloading and focus on increasing operational productivity by means of telematics and IoT. Predictive maintenance, for instance, will ensure uninterrupted trailer performance at peak level while still contributing to lower CO2 emissions and lengthening overall product life. Kässbohrer’s smart trailers have predictive qualities that contribute to road safety, load safety and to the safety of the people. Q: Will we see an example of that work at the IAA Show? AN: Yes, three our products having these features are nominated for this year’s Trailer Innovation Awards. The first is our SSL silo vehicle with autonomous discharge; the second is our SSK safety silo that detects site risks and directs unloading operations accordingly through an easy-to-use interface; and the third is our novel octagon central frame design that increases load factors and shortens operational processes. It can be seen on our multi-functional container chassis. ZN: We always present our customers with the highest quality and the most competitive products and services. For his purpose, even though we have been offering telematics services since 2013, this year we partnered with WABCO to be able to offer individualised telematics interfaces that have been tailor-made for each brand and can be adjusted to suit each customer. Come and see us in Hanover to learn more. Q: Final question: Congestion and the need for more flexible urban transport solutions have dominated the debate in the lead up this year’s IAA. How does the Group respond? Are we witnessing a long-term shift from articulated vehicles to more flexible rigid trucks and vans? ZN: It’s a topic that is very much top of mind for us. All the way back in 2013, we first presented a special truck body with adjustable crossbars that enabled the upper structure to be mounted on any brand truck just within three days – but maybe we were ahead of our time then. AN: According to the UN, 68 per cent of the world population will live in urban areas by 2050, so the trend is certainly real – as are the resulting problems such as road congestion, CO2 emissions, PM and NOx emissions, parking and logistics sprawl. We are working hard to be part of the solution, but we can’t do it alone: A December 2017 study by the European Commission has shown that problems such as road congestion or CO2 emissions cannot be solved solely by changing vehicle characteristics. ÇN: As we are witnessing a change in intercity and inner city logistics and warehousing, there will be a change in the role and usage of trailers within the supply chain. Trailers might be put into usage as a last-mile storage space to improve customer delivery services, for example. Instead of logistics warehouses at the city boundaries, they will be transformed into micro-depots to provide the fastest delivery services. We will make sure the Group is prepared for any such scenario. 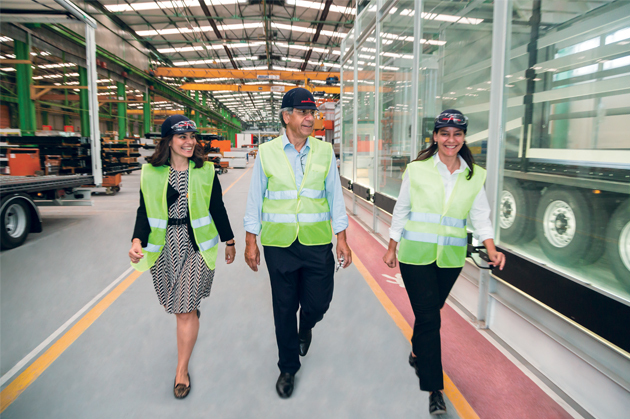 Q: Mr Nuhoğlu, you must be incredibly proud to be able to lead one of the largest family-owned trailer manufacturing businesses in the world side-by-side with your daughters, Ayşenur and Zeynep. How did you go about involving them in the organisation? Çetin Nuhoğlu (ÇN): It’s a very special situation for me, and it’s been a long time coming. Our goal was always to have the second generation assume a more active role for the sustainability of the corporate structure, so we made sure to involve them early on. Both Ayşenur and Zeynep have received an excellent education, but they had to experience all department roles from the ground up. Their further education and training are planned so as to enable them to be in leadership positions in international companies within the next decade. Q: Have any internal dynamics changed after your daughters joined the company? ÇN: I’m glad to say our company has always been gender-blind. Competence, experience and commitment are the criteria by which everyone here is evaluated. The CEO of our Turkey sales and aftersales operations, Mrs Ferda Özmen, has been with us for over 20 years, for example, and Ms İffet Türken – well known throughout the global trailer industry – continues to excel as the Kässbohrer Board Member responsible for Business Development. So no, they didn’t have to break new ground. Q: How have you envisioned the future of the organisation when you first set out? ÇN: The goal has always been to build an international company that would produce not only for Turkey, but for the world – blending local norms with global values to create a structure immune to any country’s performance. In line with that, it has always been my aim and principle to produce at the highest quality, and to realise the best work for humanity and for the environment. I think we have accomplished all of that. Because once your aim is excellence, size and impact naturally follow.